For our vacation this year (2000) we decided to go to Holland, Netherlands and bike for one week and since we were already in Europe then to go to Italy for the next week. Our flight was scheduled to leave Detroit Thursday, April 20th at 1:45 pm, but left at 4:10 due to weather delays. We got to Newark at 5:20, and boarded right away on our plane to Amsterdam that left at 6:05 pm. We arrived in Amsterdam on Friday at 1:30 am our time, 7:30 am their time (they are 6 hours ahead of Detroit). Total flight time about 8 hours. In the complex they also have a train station and we took some cash out of a bank machine, this is how you get the best exchange rate, just make sure you bank is connected to the European banks. We took a KLM shuttle for 17.50 guilders per person ($1 = 2.32 guilders at that time) to our hotel. We found out later that we could have taken the train to central station, which was close to our hotel for 6G, but the shuttle took us right to our hotel so we didn't have to find it. We checked in at the Crowne Plaza by 9:00 am. After cleaning up we went out and went to the Anne Frank House, 10G, then stopped for lunch in a middle eastern cafe, 35G. Then back for a nap and then out for a walk at 4:00. 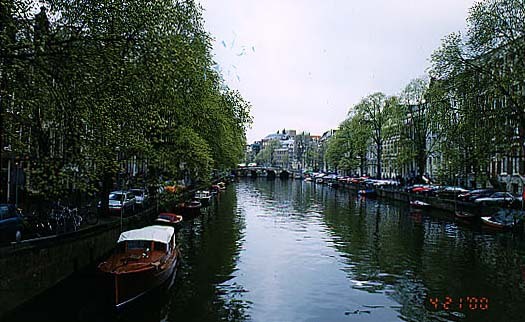 Amsterdam has many canals and bridges and the water is very dirty looking. There is a lot of interesting architecture. 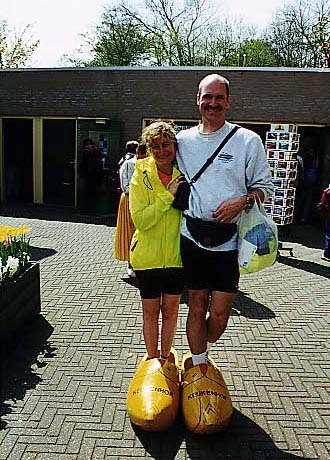 We walk through the edge of the Red Light district and around our hotel. Prostitution is legal in Amsterdam and marijuana is sold openly in coffee shops. We also saw stores selling magic mushrooms and marijuana. After our amazement we went off to a relaxing dinner. We stopped in a restaurant called La Madonna near the hotel, I had cannellone and Lynn had pasta and mushrooms, we both had Hennikens (65G), tip is usually included in the bill. I bought a tee at a Grasshopper coffee shop and we were back in our room by 9:30 to rest up for our bike trip starting the next day. We got up at 8:00, packed, and took the trolley (3G per ride) to the Van Gogh museum. It was a 4 min. ride on trolley 2 or 5. We got there at 9:30 and they opened at 10:00 so we went to the Brasserie van Gogh cafe for breakfast. I had apple pancakes with coffee and Lynn had Gouda, and mushroom omelette with cappucino (41G). At 10:10 we were done and suprised to see a line already formed at the museum, it took us 25 min. in the rain to get in. 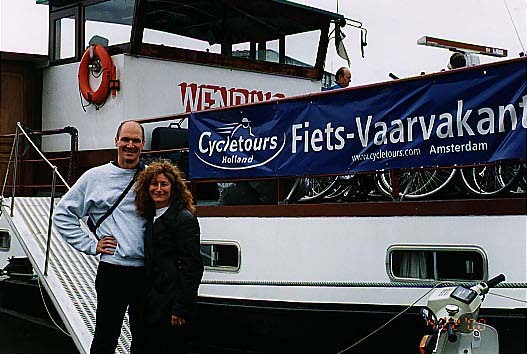 We then went back to the hotel, retrieved our suitcases and walked to Central Station to get some more cash out of our bank machine, then we walked to Cycletours barge for our week of Bike & Boat. 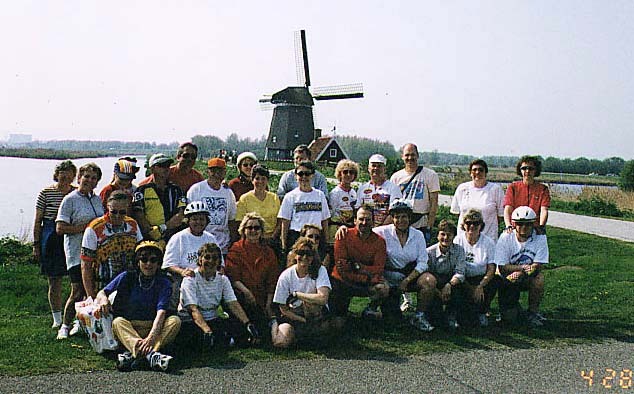 We did Cycletours Bike & Boat in Holland Southern route ( www.cycletours.com ). We boarded the Wending barge on Saturday, April 22nd at 1:45 pm. Our guide for this week was Hommo Edzes who is able to speak at least four languages. 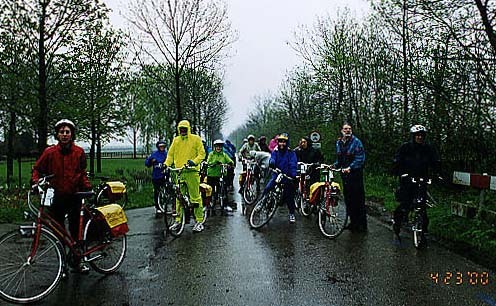 Our group of 29 included French, German and English speaking cyclists, so Hommo had to explain sites and instructions in three languages. 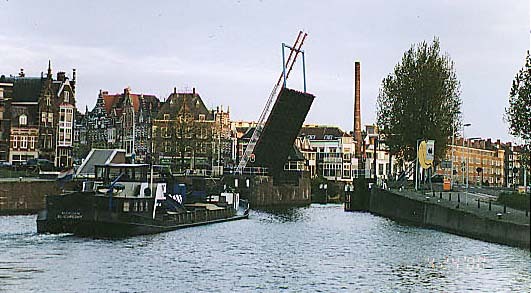 The barge left at 3:00 and stopped at 4:30 for a test ride by Nigtevecht, Breukelen, Utrecht, so everyone could test there bikes and make any adjustments necessary (17 km). It rained lightly, so I was glad we had packed rain suits. At night some of us biked around Utrecht from 8:00 - 11:00 pm (8 km). We biked about 25k for the day. Sunday breakfast was served onboard at 8:00 and we left by bike at 9:00. This was Easter and we stopped at a McDonalds for lunch. It rained on and off for 60% of the day. We passed many sheep, goats, heron, ducks, canals, and some cows. 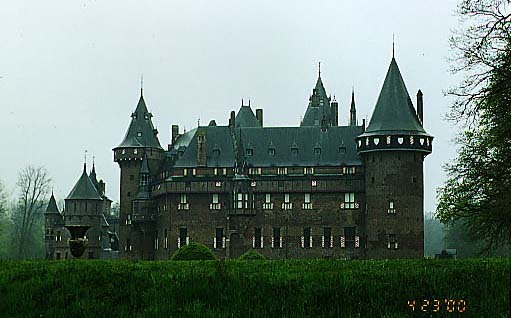 We saw Haarzuilens Castle which is owned by a family that only lives in it in August and September. 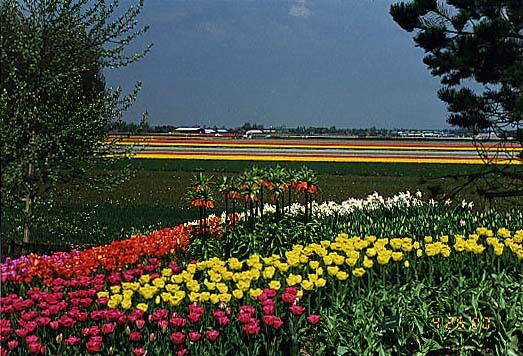 Our trip today took us through Woerden, Linschoten, Oudewater, Haastrecht along the rivers Hollandse IJssel, Vlist, Lek to Schoonhoven where we stayed for the night. On the street in front of the town hall you can see a stone circle where a witch was once burnt to death. The town hall was built around 1452. We went to the barge for dinner and after dinner walked around Schoonhoven. For the day we biked 55 km or 34 miles. Monday, April 24, (breakfast and departing every day at 8:00 and 9:00). During breakfast you packed yourself a sack lunch for the afternoon. The food on the barge was not gourmet but, good and usually plentiful. We crossed the river by ferry and biked thru Neuwport and on to Groot Ammers which is well-known for its stork colony. 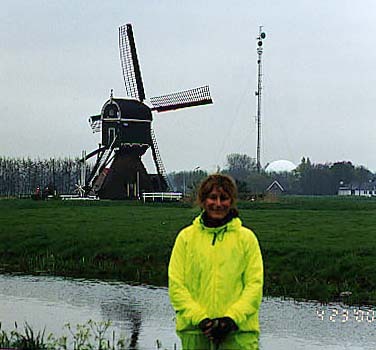 We passed many windmills on our way to Kinderdijk. Everyone except five of us rode the barge from Kinderdijk to Rotterdam. 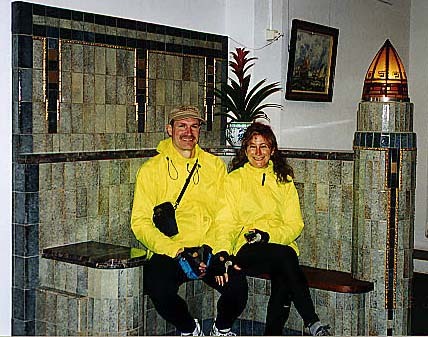 The five of us (Cal Tax, Tim & Sue Whittle, Lynn and I) rode our bikes to Rotterdam (28 km & 25 km). 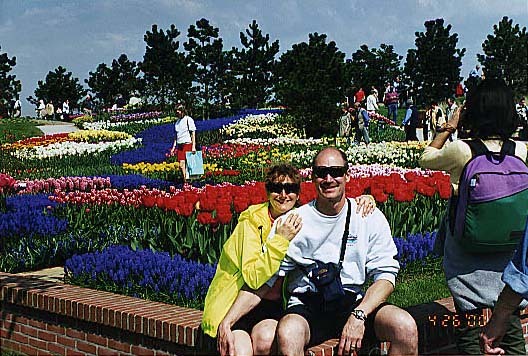 We met a nice couple in the park by the Euromast while out walking with Sandy, Cal, Tim, Sue and had drinks with them in a bar in the park. 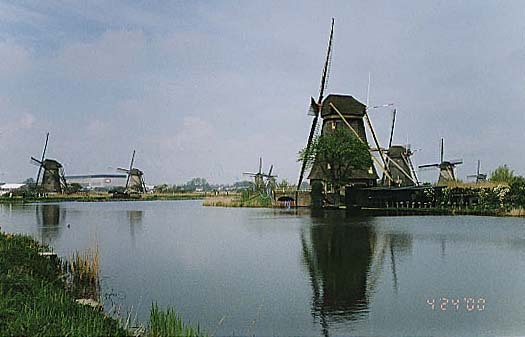 Thursday, Leiden to Oude Wetering, and a break for coffee and pie then on to Lisse. We stopped to see a upcoming flower parade being built. On to Haarlem for a total of 59 km today. Shopped across the street, then had dinner and then went to an Organ Museum that Captain Willem supports. Saturday, goodbye Holland, hello Italy!